The humans aren't the only side that adapts and advances as the war goes on, the Martians do too, perhaps faster. 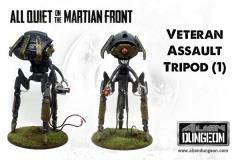 An object of dread on any battlefield, Veteran Assault Tripods are outfitted with extra armor on their legs, carapace and cockpit. While this extra weight makes them a bit slower than a regular tripod, their level 12 armor repels all small arms including machine guns and is difficult to breach with smaller guns. They are more powerful on the attack as well with an extended lens Heavy Heat Ray with Power of +4 on the sweep and a Power level +4 single shot with an extended range of 40 inches! This plastic and metal hybrid kit gives you all the parts you need to build a single Veteran Tripod. This Product is NOT A TOY and is recommended for Hobbyists ages 14 and older.